Pneumocystis jirovecii (previously classified as Pneumocystis carinii) was previously classified as a protozoa. Currently, it is considered a fungus based on nucleic acid and biochemical analysis. Frenkel JK. Pneumocystis pneumonia, an immunodeficiency-dependent disease (IDD): a critical historical overview. J Eukaryot Microbiol 1999;46:89S–92S. Stringer JR, Beard CB, Miller RF, Wakefield, AE. A New Name (Pneumocystis jiroveci) for Pneumocystis from Humans. Emerg Infect Dis 2002;8:891-896. Pneumocystis stages were reproduced from a drawing by Dr. John J. Ruffolo, South Dakota State University, USA published in Cushion M. Pneumocystis carinii. In: Collier L, Balows A, Sussman M, editors. Topley and Wilson’s Microbiology and Microbial Infections: Volume 4 Medical Mycology, 9th ed. New York: Arnold Publishing; 1998. p. 674. Copyright held by Arnold Publishing and reproduced here by permission of Arnold and Dr. Ruffolo. Our thanks to Dr. Melanie T. Cushion for her comments on the life cycle text. Ruffolo JJ. Pneumocystis carinii Cell Structure. In: Walzer, PD, editor. Pneumocystis carinii Pneumonia. 2nd ed. Marcel Dekker; 1994. p. 25-43. Cushion MT, Ruffolo JJ, Walzer PD. Analysis of the developmental stages of Pneumocystis carinii in vitro. Lab Invest 1988;58:324-331. This is a generalized life cycle proposed by John J. Ruffolo, Ph.D. (Cushion, MT, 1988) for the various species of Pneumocystis. These fungi are found in the lungs of mammals where they reside without causing overt infection until the host’s immune system becomes debilitated. Then, an oftentimes lethal pneumonia can result. Asexual phase: trophic forms replicate by mitosis to . Sexual phase: haploid trophic forms conjugate and produce a zygote or sporocyte (early cyst) . The zygote undergoes meiosis and subsequent mitosis to produce eight haploid nuclei (late phase cyst) . Spores exhibit different shapes (such as, spherical and elongated forms). It is postulated that elongation of the spores precedes release from the spore case. It is believed that the release occurs through a rent in the cell wall. After release, the empty spore case usually collapses, but retains some residual cytoplasm . A trophic stage, where the organisms probably multiply by binary fission is also recognized to exist. The organism causes disease in immunosuppressed individuals. Worldwide, in humans and animals. Serologic evidence indicates that most healthy children have been exposed by age 3 to 4. Pneumocystis pneumonia (PCP) occurs in immunosuppressed individuals and in premature, malnourished infants. The symptoms of Pneumocystis pneumonia (PCP) include dyspnea, nonproductive cough, and fever. Chest radiography demonstrates bilateral infiltrates. Extrapulmonary lesions occur in a minority (<3%) of patients, involving most frequently the lymph nodes, spleen, liver, and bone marrow. Typically, in untreated PCP increasing pulmonary involvement leads to death. Trophozoites of Pneumocystis jirovecii are 1-5 µm, pleomorphic and contain a single nucleus. Trophozoites are found in the lungs and many other extrapulmonary specimens, especially in immunocompromised patients. Figure A: Trophozoites of P. jirovecii in a bronchoalveolar lavage (BAL) specimen from an AIDS patient, stained with Giemsa. Pneumocystis jirovecii cysts are thick-walled, rounded and approximately 5-8 µm in size, although thin-walled cysts exist also. Cysts contain up to eight intracystic bodies. Precysts have also been described for this organism. Precysts are spherical, 4-7 µm in diameter and do not contain intracystic bodies (but may contain one or more nuclei). Cysts are found in the lungs and many other extrapulmonary specimens, especially in immunocompromised patients. Figure A: Cysts of P. jirovecii in lung tissue, stained with methenamine silver and hematoxylin and eosin (H&E). The walls of the cysts are stained black; the intracystic bodies are not visible with this stain. Figure B: Cysts of P. jirovecii in lung tissue, stained with methenamine silver and hematoxylin and eosin (H&E). The walls of the cysts are stained black; the intracystic bodies are not visible with this stain. Indirect immunofluorescence using monoclonal antibodies against Pneumocystis jirovecii. Pneumocystis jirovecii indirectIF are thick-walled, rounded and approximately 5-8 µm in size, although thin-walled indirectIF exist also. indirectIF contain up to eight intracystic bodies. PreindirectIF have also been described for this organism. PreindirectIF are spherical, 4-7 µm in diameter and do not contain intracystic bodies (but may contain one or more nuclei). indirectIF are found in the lungs and many other extrapulmonary specimens, especially in immunocompromised patients. Figure A: Indirect immunofluorescence using monoclonal antibodies against Pneumocystis jirovecii. Figure B: Direct immunofluorescence antibody stain using monoclonal antibodies that target Pneumocystis jirovecii. This image is from a bronchoalveolar lavage (BAL) specimen from a patient with a malignancy. Image courtesy of Brigham & Women's Hospital, Boston, MA. The specific diagnosis is based on identification of P. jirovecii in bronchopulmonary secretions obtained as induced sputum or bronchoalveolar lavage (BAL) material. In situations where these two techniques cannot be used, transbronchial biopsy or open lung biopsy may prove necessary. Microscopic identification of P. jiroveci trophozoites and cysts is performed with stains that demonstrate either the nuclei of trophozoites and intracystic stages (such as Giemsa) or the cyst walls (such as the silver stains). In addition, immunofluorescence microscopy using monoclonal antibodies can identify the organisms with higher sensitivity than conventional microscopy. 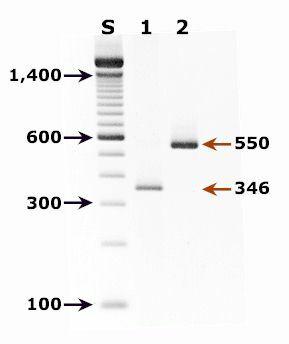 Agarose gel (2%) analysis of PCR-amplified products from DNA extracted from a broncho alveolar lavage (BAL) diagnostic specimen of a patient with pulmonary symptoms. Molecular methods for detection of P. jirovecii have shown very high sensitivity and specificity and constitute the gold standard for detection of this pathogen. Agarose gel (2%) analysis of PCR-amplified products from DNA extracted from a bronchoalveolar lavage (BAL) diagnostic specimen of a patient with pulmonary symptoms. Lane S: Molecular base pair standard (100-bp ladder). Black arrows show the size of standard bands. Lane 1: Single step PCR amplification with the pAZ102-E/pAZ102-H primer pair1 – diagnostic band size: 346 bp. Lane 2: Nested PCR amplification with the ITS nested PCR primers, 1724F/ITS2R (first round) and ITS1F/ITS2R1 (second round)2 – diagnostic band size: 550 bp. Wakefield AE, Pixley FJ, Banerji S, Sinclair K, Miller RF, Moxon ER, Hopkin JM. Amplification of mitochondrial ribosomal RNA sequences from Pneumocystis carinii of rat and human origin. Mol Biochem Parasitol 1990;43:69-76. Lu JJ, Chen CH, Bartlett MS, Smith JW, Lee CH. Comparison of six different PCR methods for detection of Pneumocystis carinii. J Clin Microbiol 1995;33:2785-2788.